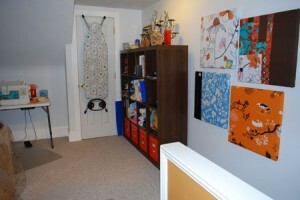 The fabric area of my studio complete with brand new bulletin boards. This Ikea shelving and orange boxes are perfect for this area. My custom bulletin boards are finally hung! I feel like my studio might almost be done. My husband and I started redecorating our third floor over a year ago with new paint, carpet, shelving…the works. It’s been a very slow process because we did most of it ourselves. The bulletin boards are at the top of the stairs, so it's like an art gallery as you enter the room. The chunk of it was done last spring but organization eluded me for a long time and it took a while to find the right shelving. Bulletin boards were my last big push and, of course, I couldn’t just buy cork from Staples. They had to be fancy-pants bulletin boards I made myself from stuff I found here and matching fabrics. I chose three Ikea fabrics and then made a mosaic using those fabrics and some Laura Gunn scraps that Kristen was so gracious to give to me. And finally they are on the wall. It’s sad that both my husband and I have grandfathers who were carpenters, yet neither of us can hang a coat rack without worrying it’ll fly off the way and whack us in the forehead. Luck for us there are people like Chris Fairchild from In Order to Organize. All my jewerly supplies in one area neatly labeled. 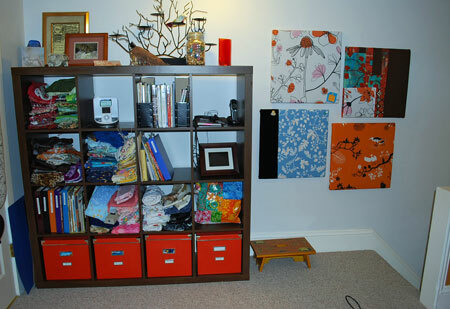 I need one more piece of furniture to marry the beading area to the sewing area. Coming soon! Chris owns a personal organization and personal training business right here in Easton. Not only can he put holes in my 100-year-old walls without worry, he can organize, build, plan and create. Chris organizes any aspect of your home, business or work flow. In spring, Chris talked me through how I use each section of my studio and what would make the most sense in terms of storage and organization. He helped me decide on shelving, and I plan to have him make shelves for a closet and a wall shelf above my sewing machine. That’s his other great talent. Chris can design and build custom pieces for your house. He hung my bulletin boards for me and I am eternally grateful. I assisted him as he figured out the spacing (does holding a level count as assisting?). If I’d hung them they’d be crooked, and I’d have to lie that uneven spacing is art at its best. Instead he measured and drilled and they look beautiful. So is my studio finally done? I suppose as done as it’ll ever be. 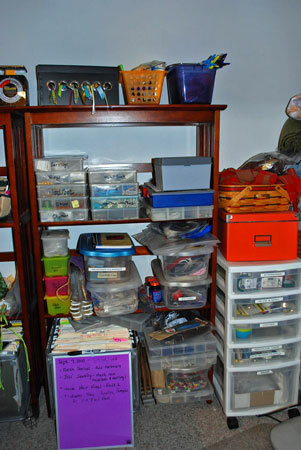 I have a few boxes to unpack and I still can’t find my rotary cutter, but that may just be a casualty of reorganizing. 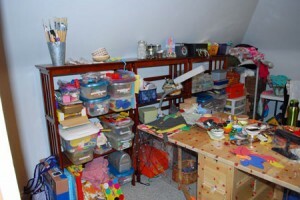 The kids supplies and crafting area is on the left side of the table. It's not as tidy-looking as I'd like, but it's functional. Once everyone can read, I might transition to more orange storage boxes. This entry was posted in About, Fabric, Jewelry, News and tagged bulletin boards, Fabric, In order 2 organize, Jewelry, organization, studio by Susan. Bookmark the permalink.